The event officially opens Saturday 20 October at 20:00, attended by Prince Albert, Monaco bigwigs and a Bavarian delegation. Organized by Monte Carlo SBM. 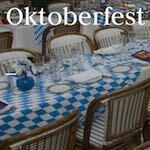 For more information and reservations phone +377 98 06 36 36 from 10:00 to 19:00, email ticketoffice[at]sbm.mc, and visit the organizer's website at: Monte Carlo SBM: Oktoberfest 2017 at Cafe de Paris.